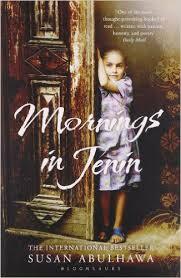 Susan Abulhawa’s novel Mornings in Jenin is a revelation. The last few days our TV screens have been inundated with images from a little part of the Middle East called the Gaza strip as the seemingly unending battle between Israelis and Palestinians plays out. This drama best portrayed on Al Jazeera TV has been going on ever since the state of Israel was born in 1948. This was when the then world power Britain separated part of their dominion in that part of the world for the Jews who had been almost exterminated by the murderous Nazi regime led by Adolf Hitler. Your perspective on this story depends on which side you look at it from. On one side the Jews were looking to return to their ancestral lands determined to “Never again” be victims, while on the other side the Israelis were considered an invading colonizing force by the Arabs staying in the land of Palestine. So which is the correct position? The answer is a hard one but literature is a pretty good way of getting at least one side of the story. Growing up in Nairobi, I have been inundated with the story of one side of the conflict; the Israeli one. We are well aware of the pain that the Jews had to go through during the Second World War. This was from watching movies like Escape From Sobibor on KBC TV at least once a year. Any human being watching that genocide on film could not fail to sympathise with the Jews. For many years I have only seen the side of the Israelis until I encountered one of the most stunning pieces of literature shedding light on another side to the madness: Mornings In Jenin from Palestinian-born Susan Abulhawa. This blog focuses strictly on African books but I make an exception because the writer was a guest of Time of The Writer, one of this continent’s leading literary events. That makes it count as fair game in my terms of reference. Mornings In Jenin follows the tale of a Palestinian family known as the Abulheja whose lives are turned upside down when they are forced to leave their ancient village of Ein Hod to a refugee camp in Jenin. Yehya Mohammad Abulheja and his wife Bazima alongside their two sons Dharweesh and Hasan are going for harvest week for olives in 1948 in an idyllic life for farmers. The family soon find themselves in a refugee camp with no opportunity of returning to their ancestral land after the birth of the state of Israel. We see Yehay Mohammad wistfully always hoping for a return that never happens. Hasan and his wife Dalia beget (let’s get bibilical no?) Yousef, Ismael and Amal. An attack from the Israelis results in one of the boys Ismael being kidnapped by Israeli soldiers and being raised as an Israeli, with the same prejudices against Palestinians that some Israelis have. Yousef stays in Jenin, marries Fatima and begets more children for the Abulheja line. Yehya Mohammad’s grandchild and their daughter, Amal, eventually escapes to the US. The character development in this book humanises the Palestinians who live in the refugee camps as people with real issues to deal with – in a way I had never thought of much before. There are many strong characters that are brought to light. The characters that stood out for me most were Dalia and her three children Yousef, Ismael (who becomes Israeli David Avram) and Amal. These four become the centre of the tale. The prose is brilliant. The brutality of their life is portrayed painfully as folks go through the experience of occupation. Morning in Jenin showed that the pain the Jews suffered was then passed on to an innocent party – the people who happened to be living in Palestine when the Israeli homeland was born. Another lesson from the book is that perhaps the story that we keep hearing about the land of Israel having been completely reclaimed from the desert using the kibbutz may not be 100 percent true. Some of the land producing olives and other goodies was simply expropriated from other folks who are now living in refugee camps. If this is the position with the olives what else could be untrue? If you want to see this battle in the Gaza through the eyes of the Palestinians then you want to get a hold of Mornings In Jenin. You will need to have a handkerchief next to you as it will assault your emotions. If those people being bombed right now in Gaza feel anything of the emotions brought out by Abulhawa’s Mornings in Jenin, then the insurrection against Israel makes perfect sense. Your experience of reading this book as well as your previous impressions of the Israel / Palestine conflict closely mirror my own. It makes sense as we both grew up in former British colonies. I also devoured Leon Uris in my teens. One of the things that really struck me was that Palestinian families had been living on this land for 1000 years! Forced removals indeed. Yet again, as you say, I find literature to be the best way to learn about situations. Learning how it feels for people is hardly ever explored in history books. James, thank you for this review. I’m honored to find this novel among African literature. The honour was really mine. This book was awesome! yes the Israelites are the same as their tortures from the second world war. it wasn’t the arabs who tortured them then but Christians. what right have they to take someone else’s land and homes and kill off the occupants or terrorise them in camps. how can they even look at themselves in the mirror and not say I am doing what the Nazis in germany done to my family. where is nato and the European council in this genocide. why is no one listening. thank god the Israelites didn’t decide on my country to call israel.